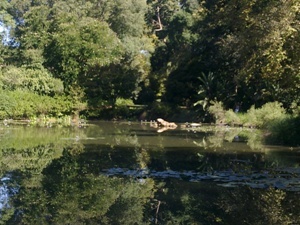 The wetland section of the Garden includes the Kingfisher Dam, the Dorpspruit River and the rehabilitated wetland. 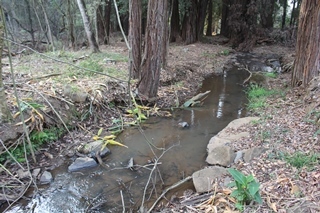 This part of the Garden is important as many bird species are attracted to the dam and river areas. 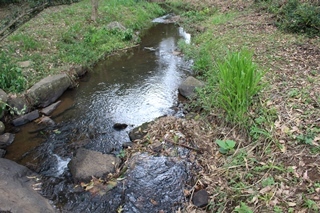 In addition, it provides irrigation water for the Garden. Regular alien plant clearing is carried out. In this section of the Garden visitors will find a colony of fever trees (Acacia xanthophloea). Fever trees are found in low-lying swampy areas of South Africa. 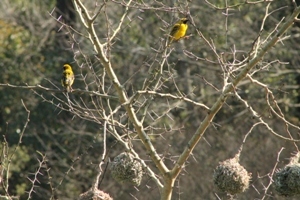 This tree is popular amongst birds for nest building as the thorns add extra protection against predators such as snakes. Young branches and leaves are eaten by elephants and the leaves and pods are eaten by giraffes and vervet monkeys. Monkeys and Grey Louries also eat the flowers. The gum and green seeds are eaten by baboons. Insects such as bees are attracted by the yellow colour and sweet scent of the flowers and play a pollination role. Unfortunately the lake, situated in the heart of the Garden, has been silting up and getting shallower, with the process becoming rapid in the last 3 years despite intervention. Its bottom has been filling up with polluted sediments brought in by stream inflow and this situation is threatening resident plant and wildlife. It is hoped that a dredging operation will commence next winter to return the lake to its previous state. In its normal state this peaceful stretch of open water is very rich in bird life, and a family of otters was occasionally spotted in the river that flows into it. A pair of black ducks were also resident in this area. Around the lake is the Turraea Trail, an easy walk which gives excellent views of the lake and several good bird-watching spots. Look out for honeysuckle (Turraea) flowers on the walk. Their sweet fragrance fills the air in September and October. Birdwatching in the Garden is excellent. Over 151 different species are found here. This high diversity can be attributed to the many indigenous plants in the Garden – each one attracting its own particular group of birds to feed, nest or enjoy shelter. Kingfisher Lake used to be a haven for the most wetland fauna and flora. 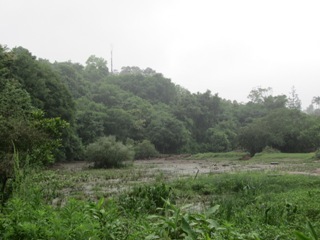 The lake is encroached by invasive alien plants deposited by floods, birds and the stream inflow. The area is not accessible for spraying and cutting of the alien plants due to the quicksand-like mud present. Alien plants have grown rapidly, forming a small forest of invaders with bug weed outgrowing the rest to mimic an emerging forest structure. Updates on the commencement of the dredging operation will be communicated through notice boards. Visitors are advised to stay clear of the edges of the lake in the meantime. The pictures above demonstrate how the lake has progressed from a mud-filled area to a fully encroached area. 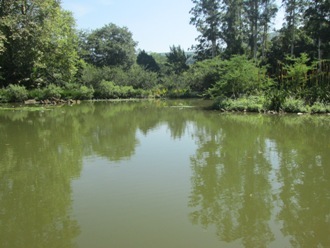 The Dorpspruit River runs through the centre of the Garden, separating the cultivated part of the Garden from the natural forest and grassland area.Unusual riverine species, such as the rare Leucadendron pondoense and the sandpaper fig, have been planted here. Dragon flies that love fast flowing waters are not to be missed on the lower part of the river. Reed cormorants can also be found swimming in most parts of the river in the Garden. 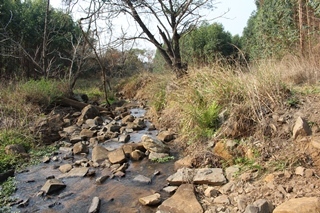 The Dorpspruit River comprises of vast alien vegetation and indigenous plants. 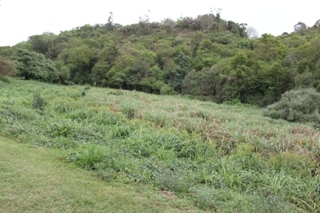 There are few unimpacted areas consisting of natural vegetation along the river. Some of these alien plants are water thirsty and consume large quantities of water which makes the river shallower. 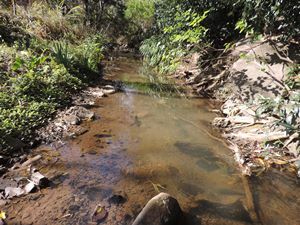 The Dorpspruit runs through residential and industrial areas before it reaches the Garden and is sometimes polluted with debris flowing down from those areas. 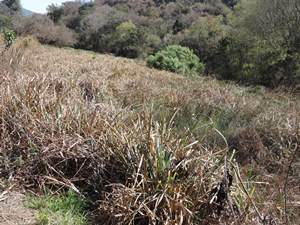 An ongoing invasive alien plants programme managed by one of SANBI’s units (Invasive Species Programme) is in place to remove alien vegetation around this area. 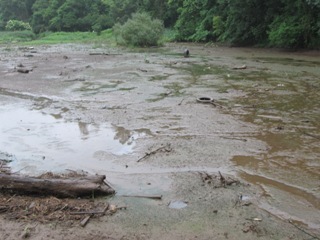 The river occasionally floods its banks after particularly heavy rainfall and that carries a lot of sediment with invasive alien plants seeds. An annual clean-up campaign that the garden hosts assists in clearing some of the pollution on the river. MiniSASS is a tool which can be used by anyone to monitor the health of a river. A sample of microinvertebrates is collected from water, and depending on which groups are identified, a measure of the general health of the river and its water quality can be determined. The Dorpspruit was declared to be in a fair condition. 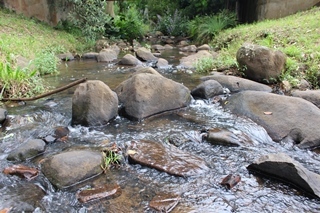 The Dorpspruit is one of the major tributaries of the uMsunduzi River which is a major trunk stream of the city of Pietermaritzburg in terms of economic importance. Clivia Dam/ wetland gets its water supply from the Dorpspruit River and forms part of our inter-connected wetland area. 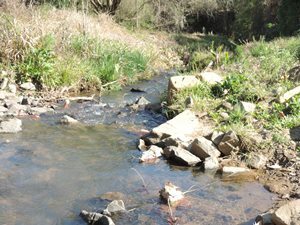 This dam opens up to the Dorpspruit River again and flows downstream towards Kingfisher Lake. 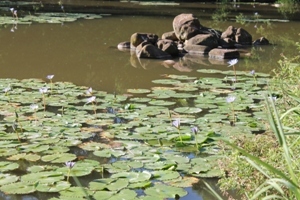 The open water of this wetland has been naturalised by the introduction of the blue and pink forms of the striking indigenous water lily, Nymphaea nouchali and Cyperus papyrus – known as the plant that produced the first paper on earth. 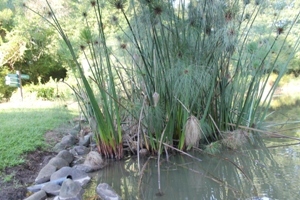 Cyperus papyrus is among a number of plants that have been planted on the banks of the wetland to stabilise it and to prevent soil erosion. 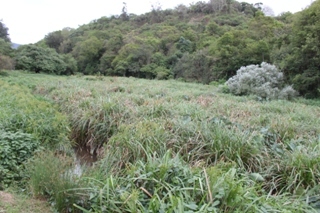 Indigenous wetland species such as Gunnera perpensa, Crinum graminicola, and Bowkeria citrina have also been planted in this wetland. 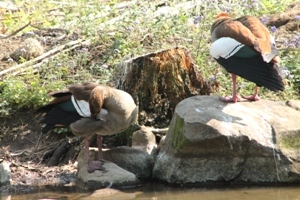 A pair of Egyptian Geese in this area regularly produces a clutch of goslings which children love to feed with bread scraps. The dam, which used to be the main water supply for the irrigation of garden beds, is very important as it attracts many bird species. 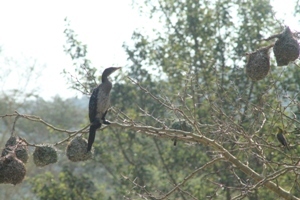 Visit in spring and summer to see Village Weavers during breeding season making beautiful nests that look like hanging fruit on these trees. A Cormorant diving into the water to catch fish is a sight not to be missed during autumn through winter. Take a moment to witness this predatory bird working its magic and make sure you take pictures. 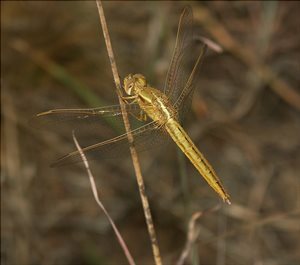 Here visitors can also spot dragonflies and damselflies and take a closer look to learn differences between the two. Damselflies are typically smaller than dragonflies. However, there are other distinctions that set them apart, including that most damselflies hold their wings at rest together above the torso or slightly open above whereas most dragonflies at rest hold their wings perpendicular to their body, horizontally or occasionally slightly down and forward. Also, the back wing of the dragonfly broadens near the base, caudal to the connecting point at the body, while the back wing of the damselfly is similar to the front wing. The eyes on a damselfly are set apart; in most dragonflies the eyes touch.